Meyer Tool’s Material Evaluation Lab in Cincinnati was created in 1999 to support the growth of Meyer Tool as it moved forward into the next phase as a leading supplier in the aerospace industry. The lab is designed to support all of the operations at Meyer Tool Headquarters as well as its satellite facilities. One of the advantages of having a captive lab is a shortened e cycle time for the processing of samples. Valuable information is quickly acquired and can be made available for evaluation. Engineers can interact with lab personnel to get a better understanding of their processes. Access to on-site resources produce timely solutions for customers. 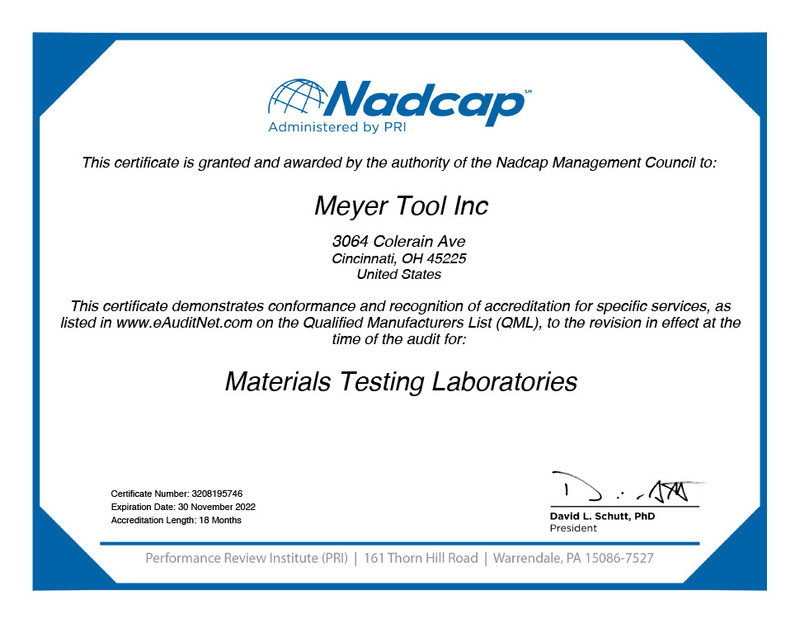 The lab has earned Nadcap accreditation as a Captive Lab for Material Testing Laboratories for Metallography, Weld evaluation (electron beam and laser) and for Evaluation of Aluminide Diffusion coatings. Additionally, the lab is certified by its major customers.